This morning, I had a blonde moment. I have been living in this city for almost 3 years now. I have lived in 2 different neighborhoods, worked at 2 different jobs downtown, and explored pretty much the entire downtown and the suburbs. Somehow, I still manage to get myself LOST. Unfortunately, I got on some road that immediately sent me to the highway with no way out. I said to myself, "no big deal, I can still get home from the highway." 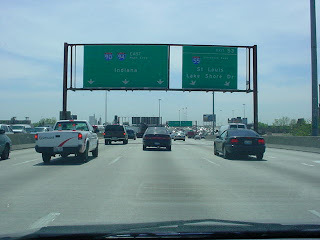 Then, just when I thought I was home free, I ended up going EAST instead of WEST on 90/94, heading towards Indiana. We all know how much I love Indiana, but this was not in the cards for today, NOT during rush hour on a Thursday! Probably still a little zen-ed out from my class, I laughed a little at myself, took a deep breath, found my way off of the highway, and rolled through a part of the city I really haven't seen before. I rolled down the window, turned up the music a little, and enjoyed a couple extra country songs than I normally would on my drive home (I may or may not have been having my own personal Lady Antebellum sing party...). You're probably wondering what the point of my little story is. Truthfully, I, myself, am still not completely sure. But, I think the point is that there are lots of little unexpected frustrating moments that pop up, especially living in a big city. For example: missing your train and having to wait another 15 minutes for the next. Or perhaps: having the 10th cheap umbrella you purchased from Walgreens turn upside down in the middle of a downpour, then conveniently snap from one of the less pleasant features of the "Windy City." Clearly, I could go on. Maybe if we could all just take a deep breath and laugh at ourselves or the situation sometimes, we'd all have lower blood pressure and fewer wrinkles. Or, maybe we'd all just find unexpected little moments of happiness like the one I found today. Remember: "An adventure is only an inconvenience rightly considered. An inconvenience is only an adventure wrongly considered." -- G.K. Chesterton.